Wallace Stevens once said, "Money is a kind of poetry." This statement captures the dichotomy he struggled to reconcile during his lifetime: being one of America's most successful and influential poets, and thinking of himself as a respectable and demure executive accountant, a conflict he would bring with him to Key West. Stevens was born to a prosperous lawyer on October 2, 1879. 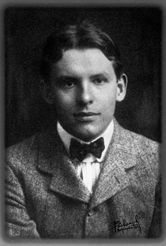 While a young man, he attended Harvard as a non-degree special student, and later graduated from New York School of Law in 1903. He was hired as a lawyer by the American Bond Company in 1908, a year before he married Elsie Moll Kachel, a working-class woman whom Stevens' parents did not deem a suitable wife. Defying his parents, Stevens married Elsie in 1909, causing a rift between him and his father. They did not see or speak to one another ever again. Despite the family conflict, Stevens carried on in his father's profession. Following a stint as vice-president of the New York office of the Equitable Surety Company of St. Louis, Missouri, he ended up working for the Hartford Accident and Indemnity Company in 1916 (he would become vice-president in 1934). Curiously enough, Stevens wrote lots of poetry throughout this period. He would frequently find a dark, isolated area in his home, a habit that used to scare his daughter, Holly, and write poetry. He also made friends with some of his literary contemporaries, including novelist Ferdinand Reyher, to whom he often wrote. By the early 1920s, however, Stevens had grown disillusioned with the artistic movements in New York and Paris, refusing to be part of either. As an executive accountant, he deemed the artistic lifestyle improper. Yet his perspective was not without underlying doubt and even longing, as he would write in his later years, "I wanted all my life to go to Paris." Instead, Florida, and especially Key West, emerged as the perfect getaway, a form of consolation for the poet. 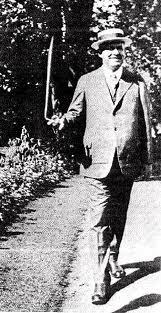 In January of 1922, Stevens made his first trip to Florida. Though this was primarily a business affair, he couldn't help being entranced by the state's beauty and seclusion. Describing his experience, he wrote, "It was very much like a cloud full of Cuban senoritas, coconut palms, and waiters carrying ice water." To his wife back in Hartford, he said, "This is one of the choicest places I've ever been to. The place is a paradise." Florida had such an impact on him that after leaving the state for the first time, he wrote to Reyher, "Since my return, I have not cared much for literature." Florida provided the perfect haven for a reclusive Stevens, who could combine business with pleasure without jeopardizing his financial security. Many poems about Florida appeared in Stevens' first two poetry collections, Harmonium (1923) and of Ideas (1936), including the anthologized pieces "O Florida, Venereal Soil" and "The Idea of Order at Key West." Between 1922 and 1940, Stevens made Key West his preferred winter destination. He stayed at the Casa Marina Resort, a luxury hotel, between two and three weeks every year, leaving his wife and daughter back in Hartford. Stevens' time in Florida was marred by a number of quarrelsome encounters with other writers. 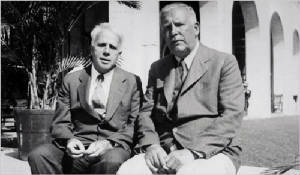 At the Casa Marina, Stevens met Robert Frost. The relationship between these literary giants seems to have been a mix of mutual respect, reserved admiration, and habitual disagreement. Stevens, who'd visited Key West on several occasions by the time Frost made his first trip in 1935, welcomed his counterpart with a bag of sapodillas, a fruit he'd discovered in Cuba. Frost was pleased by this kind gesture. However, that evening an inebriated Stevens argued with Frost at a cocktail party. Frost was so outraged by Stevens' drunken conduct that he subsequently talked about the episode at a University of Miami lecture. Elsie Moll Kachel was born in Wallace Stevens' hometown of Reading, Pennsylvania in 1886. Stevens once said of his future wife, "She was the most beautiful girl in Reading." Early on, Elsie worked as a saleslady, stenographer, and milliner, a modest background that kept Stevens' parents from accepting her as a fitting wife. The young couple tied the knot anyway, in 1909. 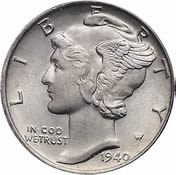 In New York, Adolph Weinman used her as a model for the 1916-1945 Mercury dime and walking Liberty half-dollar design. The artist offered her a bust of her profile as gift. Unfortunately, the marriage ended up an unhappy one, though it remained misleadingly stable throughout the years. Elsie was obsessed with her housekeeping, which Stevens liked, but he still preferred to not invite friends over to their home, causing an emotional and physical distance between them. It is said that Elsie was not by her husband's side when he was hospitalized for several days prior to his death. Their daughter, Holly, was with him instead. Eight years after Stevens passed away, Elsie became ill and died. By then the bust given to her by Weinman, which she loved, had disappeared. It is still missing to this day. The two men, who were somewhat critical of each other's work, argued again at Casa Marina Resort years later. 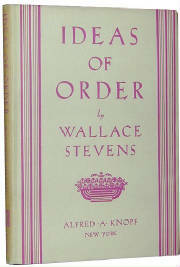 In 1954, shortly prior to his death, Stevens turned down an invitation to Frost's 80th birthday celebration at Amherst, stating, "I do not know his work well enough to be either impressed or unimpressed." Frost, in the end, fell victim to Steven's jealousy toward fellow writers who fully embraced their artistic existence. Ernest Hemingway was frequently in Stevens' line of fire, though in this case the conflicts climaxed in a physical altercation. In a letter that includes Hemingway's view of the poet: "Nice Mr. Stevens. This year he came again like the cholera…," Hemingway describes how Stevens accosted his sister, Ura, and insulted his name until she began crying. Ura ran to Hemingway's Key West home and told him what Stevens had done. The novelist went looking for the poet and bumped into him on the street. Their dispute turned violent, as Stevens hit Hemingway on the jaw, breaking his hand, while the latter knocked Stevens into a puddle and gave him a beating. Hemingway claimed that Stevens needed medical attention for five days after their altercation. 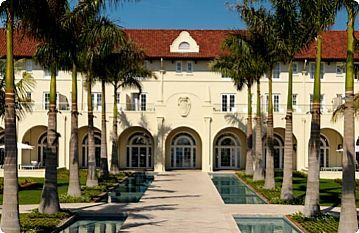 Located in Key West, Casa Marina, A Waldorf Astoria Resort began operating on New Year's Eve, 1920. It was originally envisioned by Henry Flagler as a place lodge the affluent customers who used his railroad. Though Flagler died prior to the hotel's construction, the resort was dedicated as a monument to him. Only three days after its opening, President Warren G. Harding visited the hotel, making it an even more exclusive location. The U.S. Navy bought the resort in the early 1940s and utilized it to house soldiers during WWII. Following the end of the war, the hotel became a luxurious destination once again, accommodating numerous stars, including Gregory Peck, Ethel Merman, and Rita Hayworth. The military took over the hotel once more during the Cuban Missile Crisis, followed by a period of business decline and minor renovations. After a $43 million restoration project, Casa Marina Resort reemerged as a lavish and desirable hotel. Today, its rooms are furnished with LCD TVs, espresso machines, and modern furniture. The location also serves as Wallace Stevens' Florida literary landmark. Novelist John Dos Passos, who also lived in Key West, witnessed Stevens' inebriated disdain first-hand. The poet showed up unannounced at a cocktail party at Dos Passos' home. Having never met the host, Stevens said, "I thought you were a cripple." He told Dos Passos he was disappointed at him for having so many women wearing pajamas frolicking around the house and for listening to popular music on a phonograph. In Stevens' view, Dos Passos was not behaving like a gentleman of high stature should. These episodes seem to typify Wallace Stevens' bitter struggle between his business executive life and his repressed longing to be an active part of a free literary world. Sadly, he wasn't able to reconcile this self-imposed polarity. As a result, he became known for his extensive alcohol use and contempt toward other literary figures. Stevens stopped visiting Florida due both to a government takeover of Casa Marina, and the fact that many writers had settled in Key West, eliminating the seclusion Stevens enjoyed so much. He retreated back home to Hartford. Despite his personal turmoil, defining Stevens' life or his time in Florida solely through his infamous altercations would be a mistake. It was precisely because Key West served as an escape that he was unafraid to let himself go, to externalize his demons. After all, perhaps it was Stevens' complex personality that yielded such meditative, intricate, and beautiful work. Just like Key West, his poems were a getaway, a medium to make sense of his surroundings as he tried to internally appease himself. In the end, this should be what's remembered about Florida's Wallace Stevens, that this remarkable poet found solace in his poetry and in our state, that Key West was his Paris, his New York, and often his inspiration. Dariel Suarez was born in Havana, Cuba, where he lived until 1997. He resides in South Florida with his wife. His work has appeared or is forthcoming in many publications including SmokeLong Quarterly,The Coachella Review, JMWW, Sliver of Stone, Versal, Midway Journal, and The Acentos Review. Dariel is the featured poet in New Mirage Journal's Spring 2011 issue. He's currently working on a collection of stories set in his native country as well as a poetry chapbook.